Handcrafted Dungeons are literally that, crafted and painted by hand. All the details added to the furnished tiles are also hand built components and placed in the dungeons to add to the adventure's mystery, depth, danger and treasure hunting appeal. While a bit of retouching was necessary to clarify certain features, modify some stone colors, or show lines, everything you see was either made by hand, or built from a scratch model kit as in the case of the skeletons. We made the tiles from an air dry clay, used real stones, sand, and twigs, scraps of wood and then stained, painted and antiqued the tiles. Even the arms and armor on the skeletons was hand built. 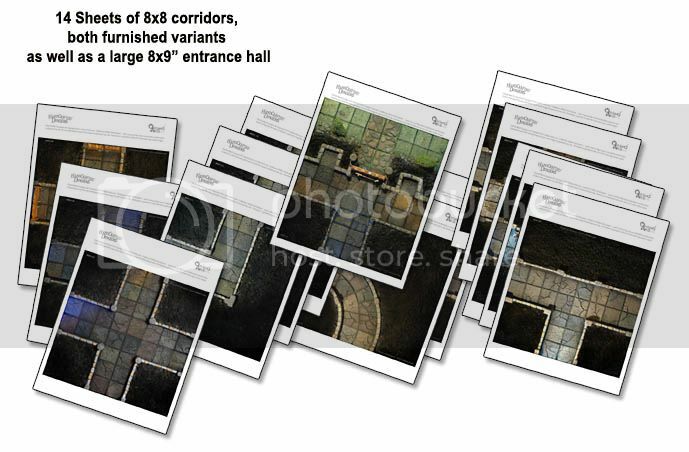 Our sets include tiles in their most basic, unfurnished variants as well as adorned or ‘staged’ versions. The staged tiles come with bones, skeletal remains, chains, bridges, barrels, staircases, doors, pits, collapsed portions of the ceiling, coffins, crates, blood spatters, treasure piles and more. Using standard one inch tiles, these grids are perfect for 20, 25 and 28mm fantasy games. These tiles provide ready to play gaming terrain that has an old school, epic sword and sorcery feel, perfect for role-playing or any fantasy miniature dungeon crawl. While there are literally hundreds of layout possibilities with HandCrafted Dungeons set 1, especially if printing duplicates of standard halls and rooms, one can always use more tiles for more options. Given this, we recommend the wonderful, highly appealing dungeon tiles produced by Inked Adventures. We liked them so much that we made a special 4 x8” connecting corridor piece, included in set HCD 1. This line will start with Classic Dungeons sets 1 and 2, and will be followed by Caverns Set 1 which is in production. If you would like to be notified when additional sets become available email us with the words 'Handcrafted Dungeons' or 'HCD updates' or similar in the subject line. 12 8X8” Chamber tiles, 5 being empty rooms with 6 variations of these that are furnished rooms. Two of these chambers have tiny rooms set inside a network of single file corridors while the twelfth is a lava filled chamber with mere stepping stones as possible access to the chambers beyond. One false step here and players will be rolling up a new character! 13 4x4" Dead Ends, perfect for closing off another tile's extra doors or hallways that might otherwise lead the minis off the tabletop! This set includes the basic square and round ends, as well as the collapsed corridor, stairwell and several furnished end pieces containing a library, coffin, outhouse, portcullis with treasure chest, and wine cellar. 5 variants of a 4x4 inch narrow point; one being an open passage, another with a door, a third with a secret door, another with an old blade trap and beheaded skeleton, and the fifth an open pit trap that the characters must try to leap across. 14 4x8" Corridors. 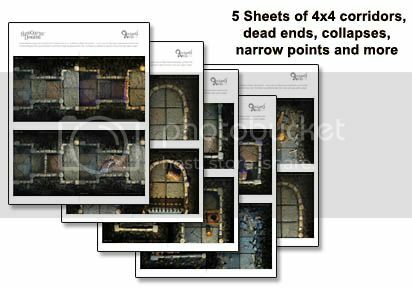 This set contains more of these than in the upcoming set two, as this collection focuses on the initial exploration of the dungeon and the expedition to lower levels. Corridors include a variety of standard, unadorned hallways, as well as several with doors, split halls, ceiling collapses, a flooded passage with slippery stepping stones, and a narrow hall with two side guard posts. 13 8x8" Corridor sections, including the 'L' turn, T-Junction and four way cross junction. There are also a pair of curved 90 degree turn corridors along with many staged and ready for encounters and other pitfalls. 4 8x8” tiles to create either an unadorned 8 x16” Grand Hall ( HCD1-60A and 60B) or, the same chamber, furnished with the left side being a feast area and the right side a throne room (HCD1-61A and 61B). By substituting either the blank left or right side for a furnished side, the banquet or throne portion can be left out. 1 8x9” Large entrance tile (HCD1-4), allowing the characters access to the dungeons you create, as well as three possible routes once inside. 2 4x8” sections that work together (HCD1-21 and HCD1-22). The first is a corridor section overlooking a deep cavern below. The only way across is a rickety, broken wood bridge. The second tile is for those characters who fall off or through the creaky bridge. This lower tile has a two apace side access opening to join it to other standard tiles. 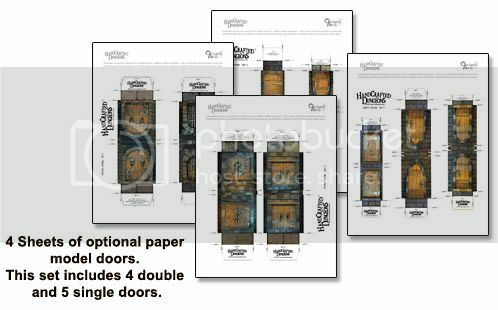 5 Paper Model Door sheets are also included offering 4 cut and assemble, free standing double doors, and five single doors. These doors are optional components and are scale models requiring simple cutting, folding and the application of a few drops of glue. Adhesive magnet strips can also be applied to their bottoms to add extra stability and weight. 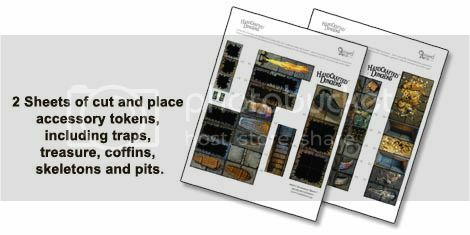 2 Accessory Token Sheets: We've included a pair of accessory sheets containing tiles of various dimensions to be used during game play to reveal traps, treasure, drains, trap doors, skeletons, fire elements, bottomless pits and much more. Most of these tokens also appear in the furnished version’s we’ve created and included in the set. These can be cut from the sheet and either placed on a game square loosely, or, adhered to the tile with some sort of removable adhesive for either in-game play or photocopying to create your own custom furnished tiles. Print on Demand Option coming very soon! Just bought two of your sets. should have looked more carefully. when are american producers of content going to realise that a large proportion of the world uses printing equipment made for 'international' paper sizes (i.e. A4) which can't print the full width of 'legal' US size at actual size. amazing oversight and very disappointing. These are fantastic - I can't wait for the caves. I am arranging for pro printing of them, i did a few at home, mounted them on foamcore, and used them on a black table cloth- the results are spectacular. First, these are perhaps most beautiful print tiles I've ever seen. However, said beauty is marred by the fact that on nearly all of them, three corners have logos, tile numbers and copyright remarks printed right on the actual tiles...so whatever awesome realism these tiles have is reduced by real world legal, commercial and logistical print. They're still awesome, the paradox here is the length they went to to make these as realistic as possible, but then went ahead and reduced the in-game immersion value with the out-of-game/real world stamps. But you should buy them anyway, because they're probably the best print tiles out there. I also wish that they had VTT version that came with this. Really pleased you like the look of the tiles. I confess that I have never played in the VTT format, and frankly, I tend to play miniature games out camping with my kids the most where there isn't even electricity! But, I agree with everything you've said and am going to remove all the logos and numbers. Also, I am looking into the VTT formatting thing right now. Seems as though we just need to make all the tiles as 300 dpi jpegs, and the token accessories into PNG versions. Does that sound correct to you? Once this is done, I will reload the files and everybody who bought set 1 will be given a link to download the updated sets. Set 2, due out any day, will also adopt these changes. Thanks for leaving a review. We aim to please! That sounds awesome and I apprecitate the fix. And you're correct about the VTT formatting. Services like Roll20.net are on the rise. It even offers a market place for tiles like yours via a keyword search (ex, corridor search would bring up an AD for your product). And your tiles are ahead of the game. I hope you release a whole series like this because, as I've said, they're the best I've seen so far. I intend to purchase them. I've already referred gamers to your product on my Dungeon Master's Tome facebook page. Whew, took awhile to resolve this but we did it. Uploading the files was the biggest challenge. 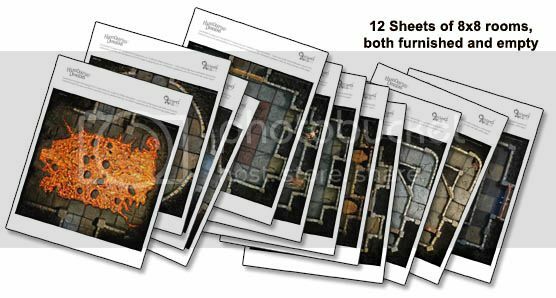 Now, Handcrafted Dungeons sets come in a larger whole file, with PDF sets in full color, grayscale and inkjet friendlier color, as well as a large zipped folder of the VTT images. 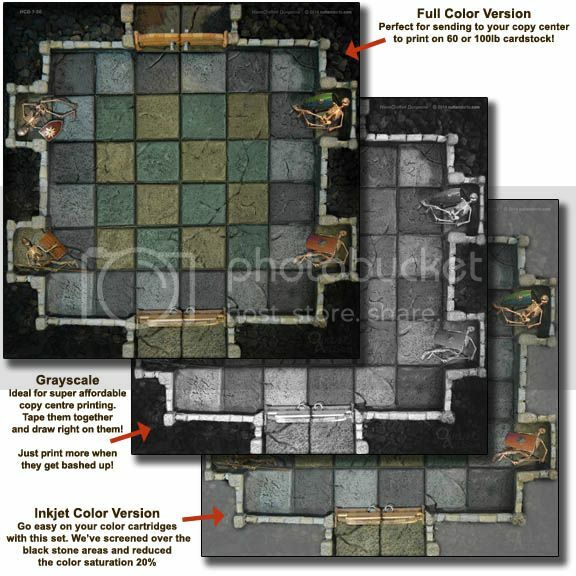 The Virtual Table Top images include all the floor tiles as 300 dpi jpegs, plus the tokens as PNG files. We added the doors as PNGs as well, but you'll have to let me know if they are of any use. Wow, just read the interaction above. What great customer service, William! I'll spread the word - and this item is now on my wishlist - just waiting on payday.